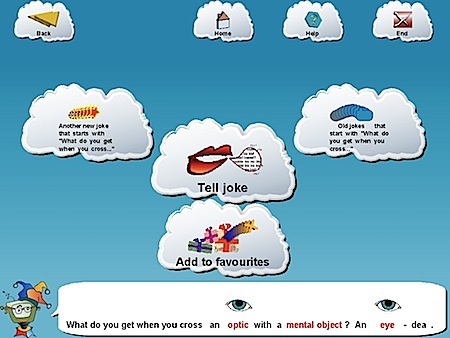 The STANDUP project (System To Augment Non-speakers' Dialogue Using Puns) is a collaborative project between the School of Computing at the University of Dundee, the School of Informatics at the University of Edinburgh, and the Department of Computing Science at the University of Aberdeen, funded by EPSRC (the Engineering and Physical Sciences Research Council). We have explored how humour may be used to help non-speaking children learn to use language more effectively. There is evidence to suggest that language play, including using puns and other jokes, has a beneficial effect on a child's developing language and communication skills. Children with communication impairments are often reliant on augmented communication aids in order to carry on conversations, but these aids give little scope for generating novel language. This inhibits experimentation with language and limits the trying out of humorous ideas, which can in turn have a stultifying effect on language development. We have begun to address this deficiency in the language environment of the non-speaking child by providing a software tool which promotes humorous language play. Starting from our previous research on the automated generation of punning riddles, we have designed and implemented a program which allows the user to experiment with the construction of simple jokes. The user interface of this system has been specially designed to be accessible to children with communication and physical disabilities. We have carried out tests of the usability and appropriateness of the system by observing and evaluating the use of our software by children. You can even download the software, if you like. When I saw this program, I thought immediately of the robot comedian from William Tenn's 1951 short story The Jester. I was pasting down one of Xero's satirical pastiches of Rubert Brooke and was six lines short. I handed Tony the master tape and he played it into the IBM, set the meter, rhyme scheme, verbal pairs, and then switched on, waited for the tape to chunter out of the delivery head, tore off six lines and passed them back to me. I didn't even need to read them. Now that the potentiometers indicated the machine's lyrical capacitance was charged to the maximum, and Trurl, so nerous his hands were shaking, threw the master switch. Update: Thanks to Ashley, we can look at another early reference, the mechanical jokester from Isaac Asimov's 1956 story Jokester; it's one of the stories about Multivac. End update. From STANDUP and THE CONSTRUCTION OF A PUN GENERATOR FOR LANGUAGE SKILLS DEVELOPMENT (pdf) via KurzweilAI.